We have included planter bench plans in the past (http://www.woodworkcity.com/wordpress/2011/02/16/free-planter-bench-plans/), but decided to offer a very similar plan. The reason for this is that the source (learn2grow.com) did such a great job with this plan. In addition to that, the plan is a bit simpler than the first plan that we posted. There are numerous photos to help you during each step. This is a beautiful bench that is made with very straightforward technique. 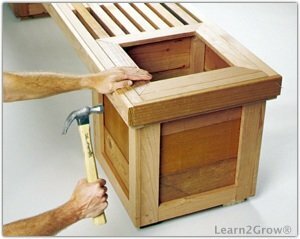 If you are building a planter bench, you should view each plan and perhaps use a piece of each to make a bench that is perfect for you. Click on the image above for a link to the full plans. Hello, the step by step picture link no longer works. Would you be willing to repost a new link for it please? I’m really keen on making one like in the picture! Or better yet that same bench with a lattice attached! With a narrow gully at the back of the bench for vine growing plants. Could I have simple coffe table plan that I can try to make myself please . Here is a simple coffee table plan. Hope this helps.